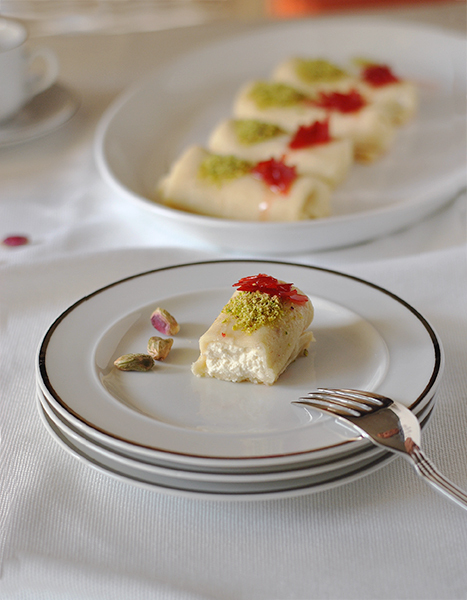 Making Lebanese desserts may seem impossible – especially if you live in an Arab country where the best sweets are readily available. But it’s not as hard as you think, and all the ingredients used for this Halawet El-Jibn recipe are not hard to find. I bet you’ll be surprised to know how easy it is to recreate this fabulous dessert at home: it’s simply a mixture of mozzarella cheese and fine semolina melted together to form a smooth dough that’s rolled out and filled with fresh kashta cheese or this whipped ricotta cheese mixture. It is then served cold with ground pistachios, rose petal jam, and simple syrup. The traditional process of making this dessert is very delicate and requires a precise ratio of ingredients that are cooked using specific utensils. It is said that some of the best Halawet El-Jebn can be found in the city of Tripoli in Lebanon, but that doesn’t mean that you can’t make it from scratch if you’re craving Arabic sweets or feeling adventurous in the kitchen! • Place the water, sugar, and lemon juice in a saucepan over a low heat, and stir until the sugar dissolves. • Turn off the heat and stir in the rose water and orange blossom water. • Let cool to room temperature. • Generously coat a 30 cm x 40 cm (12″x15″) baking sheet with simple syrup. • In a non-stick pan or saucepan, heat the fine semolina for 3-4 minutes until fragrant and evenly heated. • Stir in the mozzarella cheese until just combined. • Immediately add water, orange blossom, and rose water to the pan. • Keep stirring quickly (to prevent the cheese from burning) until a smooth and elastic dough is formed. • Take the pan off the heat and turn the dough onto the baking sheet. • Using a small rolling pin or the back of a wooden spoon coated with syrup, roll out the dough to cover the whole baking sheet. • Refrigerate for 15 minutes then cut the dough into 11 cm x 13 cm (4″x5″) rectangles. • Take a rectangular cutout, place 2 tablespoons of kashta (cheese filling) on the short side. Slightly fold the long sides towards the center, then roll the cheese dough and place seam side down on a plate. 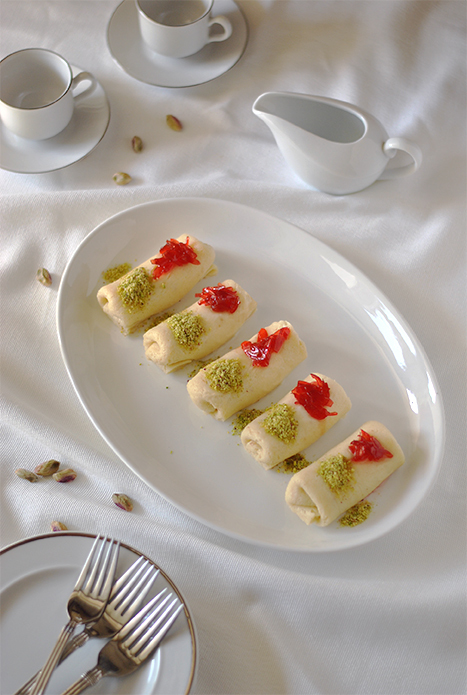 • To serve, sprinkle each piece with ground pistachios, rose petal jam, and a drizzle of syrup.